Hanging 2 heavy flower baskets or other items is no longer a problem with our patented non-leaning Shepherds hook. The secret is our special anchor spike that is driven into the ground by hammer which holds the hook strong and is adjusted straight after installation. See our product in average soil conditions holding 87 lbs of cement blocks! We intentionally overloaded one side to prove how strong it is. The spike has an easy to use adjusting feature all concealed under a small round matching decorative cover (watch the video below to see how easy it is to install, or download the written installation instructions on our website's How it Works page). The vertical member is 2 pieces of heavy wall steel pipe about 7/8" diameter, screwed together with a 5/8" alloy steel stud. 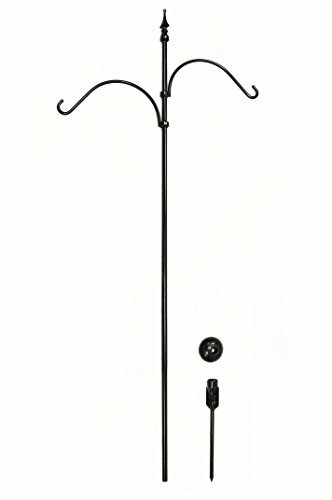 The fully adjustable hang hooks reach out 16" and are 1/2 inch round solid steel. Professionally powder-coated in a Raven Black color which resists rusting. * The anchor spike is installed with a 16-24 oz hammer (hammer not included). See how easy our Shepherd's Hook Plant & Garden Hanger is to install! HEAVY DUTY - Shown overloaded with 87 lbs. of cement blocks to prove its strength. Vertical pole screws together with alloy stud. VERSATILE - Easily holds two heavy flower baskets, bird feeders, birdbaths, or lanterns. You may also prefer to install just one of the adjustable hang arms for use as a single hook. Powder coated raven black. HANGS STRAIGHT - 87" tall above ground. Patented system adjusts straight after installation. Adjustable hang arms can be set to any position. If you have any questions about this product by Hang Tuff, contact us by completing and submitting the form below. If you are looking for a specif part number, please include it with your message.